The narrator always pointed out that their magnetic boots allowed them to walk normally on the outside of the ship. Must have been a powerful rocket to get that iron based ship up into space LOL! Early sci-fi took a lot of liberties with stuff like that. I think about the stead one g acceleration rockets in Angry Red Planet. Don't know exactly how long the flight took, but the on board clock had almost two months when they last showed it. Now starting with an assumed escape velocity of 25,000 mph, you can see with simple physics how theoretically fast the ship would be moving. Sorry if I drifted a bit from original topic. No classic telescopes in this one, but I think I remember a microscope and a Hasselblad camera. Edited by celestronlover57, 02 June 2018 - 02:27 PM. I remember a C14 in Close encounters. One of my absolute favourite films AND favourite soundtracks! John Williams tapped into something very special when he composed this incredible score. I hope I have the right telescope attached to go with your comment! Back then America was built with American steel. American steel had done a large part (along with aluminum in airplanes) to win the war not a whole lot more than a decade before this show came out. So what else would the writers have expected of ships in Space to be made of? Hard to tell, it’s so dark. This classic scope is from season 2, episode 23 of Rawhide titled "Incident of The Stargazer". It aired yesterday on MeTV. Fast forward to 10:34 to see the scope. Does anyone know what it is? p.s. For you Beverly Hillbillies and Barnaby Jones fans, Buddy Ebsen is in this episode. p.p.s. For you Star Trek fans, Richard Webb who played the disgruntled Lt. Cmdr. Ben Finney in the episode Court Martial is also in this episode. This one has been discussed before. Search back in the thread and you should find it. I can't remember what if any conclusions were reached on it. 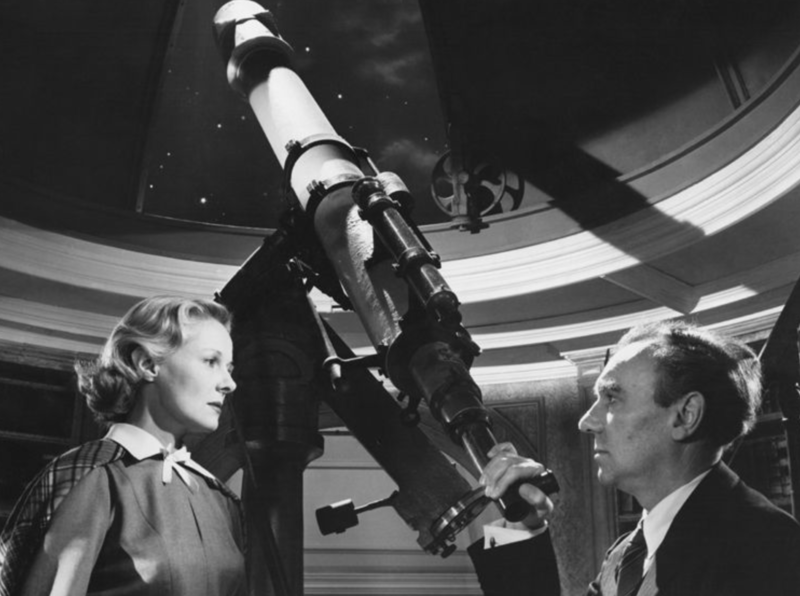 From the David Lean's film "The Sound Barrier" with Ann Todd, Ralph Richardson and maybe a Thomas Cooke telescope? 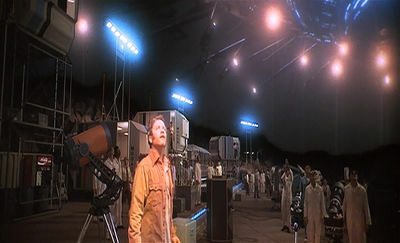 The 1979 movie 10 has two telescopes looking back and forth at each other. One is an 80MM Towa 339. the other looks like a 60mm 12TE? I had to watch that Rawhide episode. Shows how dangerous a big refractor can be when they bonk a bad guy on the head with it. They’d have a hard time observing the zenith unless they cut a hole in the floor to accommodate the eyepiece. I’ve never seen that but i found it streaming on Tubi TV. i’ll watch it today. My attempt to watch it was unsuccessful. I have never dealt with Tubi TV and it proved less than reliable for me. Kept erroring out whenever it went to a commercial. I haven't seen it either. I was watching an old interview of the director David Lean on YouTube and the film was mentioned, that film still with the telescope was displayed and I thought of this thread. Ralph Richardson is a great actor, on the level of Gielgud or Olivier. The Fallen Idol directed by Carol Reed and written by Graham Green is Richardson's greatest film! The Sound Barrier's reputation is that it's one of the few intelligent depictions of aviation in movies. Edited by Ben Bajorek, 06 November 2018 - 06:39 AM. The episode is named "Incident Of The Dancing Death" not "Incident of The Stargazer". I would say the scope is 100% real, but the set is not. There is a pretty good view of the mount from the side at the 37:04 mark. The setting circles look really big. The YouTube link to the episode incorrectly shows Incident of the Dancing Death. According to IMBD website the title is Incident of the Stargazer. Sure enough, two different Incidents! I hadn't thought of searching the iMDB for old scopes. Dog trouble, funny! Isn't that the wrong kinda dog? You could do a whole new cartoon! The Expanse (https://en.wikipedia.org/wiki/The_Expanse_(TV_series)) series' "Remember the Cant" had a scene with a big Vixen VMC260L (I think) in the background. That was my dream scope in 1977. That is the real deal.